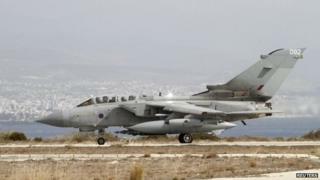 Raids against Islamic State are being conducted from RAF Akrotiri in Cyprus "with broken jets and tired and fed-up people", BBC Newsnight has been told. In a letter, a serviceman said the base was being neglected, morale was poor and ground crews had taken to eating humanitarian rations meant for Iraqis. Newsnight also understands only 16 of 102 RAF Tornado jets still meet full combat standards. An RAF spokesman dismissed many of the claims as "factually inaccurate". But a Ministry of Defence source confirmed an incident in which ground crew had been given rations had happened. The letter writer's identity is known to the BBC, but we are protecting his anonymity. He also detailed how there is no hospital at RAF Akrotiri, even though there are daily operations involving live ammunition. And he alleged that the placing of services with contractors meant that Cypriot cleaners at the base were being charged to the UK taxpayer at three times the annual cost of an airman's salary. An RAF spokesman responded: "In our opinion this letter is factually inaccurate. In layman's terms, it is completely full of holes." A source at the MoD said the facilities, as well as conditions of service, at Akrotiri are comparable with all RAF stations around the world. Despite the response, there is little doubt the conditions at Akrotiri are not as good as those service personnel had got used to on operations in Afghanistan, and that many of the RAF's people are exhausted after years of continuous deployments. The serviceman alleged that "the costs and quality of the catering and retail support are a disgrace" and that crews there are led by a chain of command, "so laced with budgetary fear... that no one knows what the plan is". Newsnight has established that during a recent visit by an air vice marshal, one sergeant from II Squadron complained about the quality of the food available to crews working overnight on Tornado jets. Contracts at the base provide only for hot meals during the day, with snacks laid on at night. The air vice marshal, on hearing the complaints, went to a pallet of rations intended for air dropping to refugees in northern Iraq. He was "so disgusted by the 'cheese sandwiches' offered as meals to the night shift, he went and broke into a pallet of aid and handed it out as it was better than what we were feeding our airmen", said the serviceman's letter. The MoD source said "crews were offered a small number of excess [Department for International Development] rations [a vegetarian curry] as a one-off gesture during a testing deployment", and argued there was no question of the crews needing the humanitarian rations in order to be "adequately fed". Shortly after operations began against Islamic State in September, the detachment of Tornado strike aircraft was increased from six to eight. Newsnight understands this increase was necessary in order to ensure there were always two aircraft available for bombing missions. Only 16 of the RAF's 102 Tornado GR4s meet "diamond fleet" standard, which is the aircraft fitted with all of the equipment necessary for combat. Many of the remainder are now mothballed. Half of these top specification jets are now in Akrotiri, but Newsnight has learned that due to their age and long use, the battle to keep them airworthy requires long hours of work by ground crews, particularly on the engines. On many days, just two or three of the Tornadoes are available for missions over Iraq. The MoD source insisted: "The Tornado GR4 continues to offer good serviceability and is meeting required tasking." Few in the RAF doubt that II Squadron, which has been flying operations over Afghanistan, Mali, and Iraq during the past year, has been under great pressure. It was due for disbandment next spring but has been reprieved because of the need to support Operation Shader, the UK effort against IS in Iraq. T shirts worn by II Squadron members at Akrotiri bore the legend "Op Till We Drop". Defence sources argued this unofficial motto was more banter than anything else. The unit has now returned to Britain for Christmas and the MoD said its members had been given an extra week's leave, in recognition of their recent efforts. In recent years the Tornados flew from Kandahar air field, in Afghanistan where there was a choice of canteens, gyms, and other fast food outlets. Both it and Camp Bastion, in Helmand, had hospitals. Many in the forces concede that these facilities were of a higher standard than those available on UK bases, and that the UK cannot afford to match them.